Ceequel® Human Resource Management. A future for you. Ceequel® HR is a fully integrated module which allows you to be in control of the data stored against your employees. You can create your own fields and design your own views but to make life a little easier, we provide over 30 standard views, encompassing, Employee Details, Emergency contacts, equipment issued, accident records, skills/training, job details and much more. View our Human Resources timeline to see it's usage over an average day. By utilising the Ceequel® time and attendance organisation chart HR software, you can create graphical representations of your company hierarchy, including parent organisations and subsidiaries. By individually assigning job titles to each position you can illustrate a true company picture. Since each position listed is fully customisable, you can add details such as job grade, location, salary, working hours, headcount, probation period, skills and qualifications. The system helps to ensure data integrity, identifies vacancies within your company, provides analysis of future needs (such as skills matching) and enhances employee development from within your company. Ceequel® is delivered with over 20 standard views or displays. Each display allows you to view relevant and pertinent information for the employee and allows authorised users to make editorial changes to the data. Each standard display mode comes equipped with a combination of fields which can be configured with predefined pick-lists thus ensuring data integrity for reporting purposes. But the advantages don't end there. 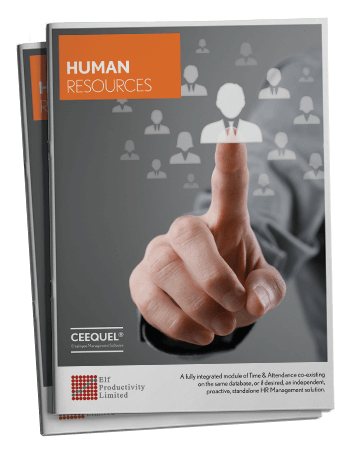 Ceequel® human resources system dramatically reduces the time spent on the more mundane areas of HR management; for example, when a new starter is brought into an organisation, there is often a long list of procedures that need following. These include issuing a contract of employment, health and safety documentation, the provisions of a laptop, a company car, details of induction days/training the notifying other departments such as payroll, security, reception and so on. Ceequel®'s human resources system new starter wizard can take care of all of this automatically. Automatic e-mails can be set up to be sent to predefined personnel with all the relevant details of the new starter included in the body of the email. Documentation can be attached to the new file and will be automatically emailed to them on their first day or if you so wish, printed off complete with a covering letter. These automated processes, which can be configured either by your HR administrator or alternatively by ourselves (we'd be happy to do so) during your implementation will remove the unnecessary hassle of organising a new start so that they can get straight to work.